In his desperation to get his story out, former president Robert Mugabe unwittingly revealed on Thursday how he had long lost control of the army, thus presenting a perfect opportunity for those disenchanted with his rule to nudge him out of power. In his first interview since his ouster last November, Mugabe did not hide his anger against his successor, Emmerson Mnangagwa, for betraying him. Tellingly, Mugabe who turned 94 on February 21 revealed he was not even aware of the tankers that invaded the streets of Harare on November 14 as military personnel sought to isolate the teetotaller from his allies in Zanu PF’s Generation 40 (G40) faction. He said: “The police had their armoury completely emptied. Their guns had gone, disappeared. Who had taken them? The army and there in the streets the tanks they rolled”. “What we never thought we had, some tanks. I didn’t know we had these tanks. I was told we had ancient ones, 1940 to 1980 tanks. T60 or is it T63 something. There, they were rolling, armoured cars running. And people were not allowed to move from one place to the other unless they got the permission of the army,” he went on. Analysts told the Daily News that the expose` confirmed fears that Mugabe had essentially become a lame duck president – unable to diligently perform his duties due to his advanced age and failing health. As such, he became hostage to G40, especially his nagging wife, Grace, whose inexperience in statecraft gave those who felt threatened by the G40 cabal ample time to ease him out of power after 37 years of iron-fisted rule. Political analyst, Maxwell Saungweme, said such revelations showed Mugabe had completely lost touch of events on the ground. “This is why he was easily manipulated by his wife and G40. He is a vintage politician, but (old) age made him lose touch. These revelations tell you that the coup was not planned in the weeks Mnangagwa was fired in November 2017. No. It was planned long back and was resourced and equipped,” said Saungweme. “You remember there used to be stories that Mugabe wanted to retire (army) generals as they had exhausted their terms, but he never managed to do it as he was no longer in charge. So he lost control long back due to old age and longevity in power. “We said it many times before that the centre was no longer holding when Mugabe was the centre. He just confirmed that. 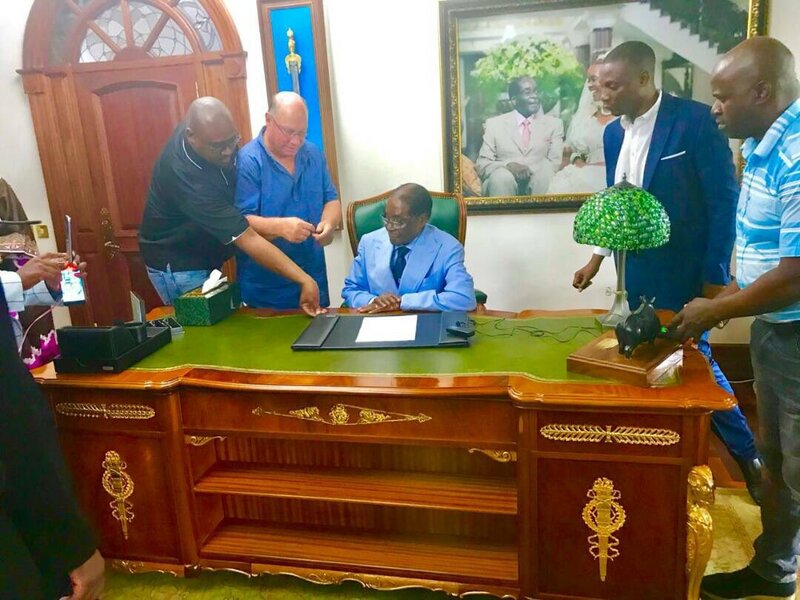 If military hardware of that level can be brought in without him or the Central Intelligence Organisation (CIO) that was loyal to him informing him, then he was as good as a mere chair warmer at Munhumutapa,” he added. Before the fallout, Mugabe did not make his dependence on the military a secret. In April 2016, he publicly thanked the military for helping his Zanu PF party win elections, singling out then Zimbabwe Defence Forces (ZDF) commander Constantino Chiwenga for his contribution to the effort. Former Zanu PF legislator and Zimbabwe Union for Democrats leader Margaret Dongo told the Daily News yesterday that events leading to ZDF’s intervention showed Zanu PF was now running two parallel governments. “Even the ministries were split along the lines of Lacoste and G40. From what, he said even in the CIO there were Mugabe and ED’s factions and he confirmed that his faction members were tortured and some of them have disappeared,” opined Dongo. On Thursday, Mugabe also described his ouster as a “coup d’état”, stating he was willing to discuss the country’s future with Mnangagwa. He also spoke about his workers’ persecution, saying they were being called one by one to be asked “very silly questions”. Mugabe also revealed how former politburo members Jonathan Moyo, Saviour Kasukuwere and Patrick Zhuwao escaped from the jaws of the military. Political analysts said Mugabe’s recent statements were aimed at de-legitimising Mnangagwa and deal a blow on his chances of winning this year’s elections. They, however, said the statements were of no political effect, as the international community has already accepted and embraced his successor’s government. Political analyst and respected University of Zimbabwe lecturer, Eldred Masunungure, yesterday said the whole thing has evolved into bitterness on the part of Mugabe and his hangers-on. Masunungure said the ousted former president still wants to demonstrate to the world at large that the administration that emerged post November 24 was an illegal regime. “He wants to undermine the legitimacy of Mnangagwa and undermine his chances of winning this year’s elections. He is saying Mnangagwa cannot be elected because he is in power illegally. He wants to portray Mnangagwa as someone who lacks legitimacy, integrity and probity,” said Masunungure. He told the Daily News that Mugabe’s statements were driven by deep-seated bitterness, which will, however, not change anything. “That’s water under the bridge as regional bodies such as the Southern African Development Community, the African Union and the international community have all endorsed the change of government,” he said. Masunungure said whether the process was done legally or illegally, the international community embraced it, as it was labouring on how to get rid of Mugabe. He said Mugabe had become an international problem, with the community wondering how to get rid of him and many felt relieved by his departure. “I don’t think what Mugabe is saying will have any traction from the international community. He is whistling in the dark,” he said, adding that the animosity between him and Zanu PF will deepen. Another political analyst Rashweat Mukundu said Mugabe was simply seeking to de-legitimise Mnangagwa and derail his campaign trail ahead of the elections expected between July and August this year. He said Mugabe was throwing spanners into Mnangagwa’s election campaign and plans by dividing the Zanu PF support base. While he retains the right to participate in politics, Mukundu averred that the truth remains that Mugabe was a largely failed leader as his policies from the 1990s led to the ruin of the Zimbabwean society. “He has a sense of entitlement to power and seeks to remain relevant by dividing Zanu PF and hopefully be venerated by ED and regain influence in Zimbabwe’s politics. What is at play is a political ego and inflated sense of importance. Regardless of the legality or otherwise of the events of November 2017, Mugabe seems not to understand that he had become a huge burden to this country,” Mukundu said. Gideon Chitanga, an analyst at the Johannesburg-based Political Economy Southern Africa think-tank, told AFP that Mugabe’s intervention was significant “coming at a time of elections”. “In the back of his mind (Mugabe) still sees himself as part of the problem and part of the solution,” said Chitanga. Mugabe sent shockwaves through the Zanu PF party when he recently met with the NPF’s leader, retired brigadier general Ambrose Mutinhiri. In response to a widely-shared image of the two, Zanu PF youth league supporters chanted “down with Mugabe” at a rally, a rare outburst from the normally disciplined party that Mugabe led for nearly four decades. Despite widespread jubilation following the army’s seizure of power, many Zimbabweans are now disenchanted by what they see as a mere changing of the guard at the top of Zimbabwe’s authoritarian system. “It was a coup with a script to turn this into a military state. The people wanted a change of the entire Zanu PF system – not just one individual,” businessman Munyaradzi Chihota, 40, told AFP as he travelled home.